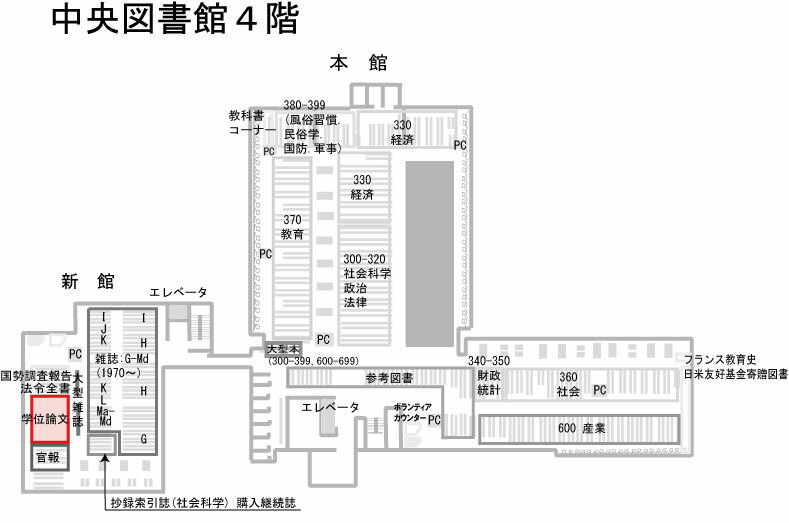 Detailed Instructions for Library Users Proposed by Learning Advisers of the University of Tsukuba Library. Frequently asked questions and useful information to make your library life pleasant are presented here. Why not make good use of these useful instructions? *Information on this page is for University of Tsukuba members. Note : All the texts are applicable to the Central Library. If another library or web are mentioned in the notes in parentheses after each subtitle, it applies to the one mentioned. ★Following abbreviations are used for the notes. “How to print” is one of the most frequently asked questions by students. We illustrate the ways how to use the PC and the printer for first users. If you are using the PC, scroll the window shown below, then you will find the procedures to follow. Smart phone users to click here. ★Please note that one sheet in color is counted as five sheets in black and white in calculating the consumption of annual allowed limit of printing. ★The maximum number of prints per year will vary depending on the major you belong to. You can check it from the below link. You need just to make printing but PC’s are all occupied. In such a case, the Printer Pre-emptive PC will be helpful. No chair to sit on is provided for the PC. You can make printing by this PC. Data in your USB can be printed too. You can use this PC as an ordinary PC, however, it is requested that you refrain from using for a long time after finishing the printing job. If the PC is initially used, some start-up time will be needed. A Library PC user, apart from the Campus-wide PC, are allowed to print up to 500 sheets a year using Library PCs. Even if you have used up your annual printable limit allowed in your Campus-wide PC and Library PC, you can print by paying the printing charge. In the case of Central Library, you will find chargeable Printer-Copier Compound Machine near Seminar Room C. of 2F and inner side of 5F. After appointing one of these compound machines from your nearby PC, then you can proceed with printing. You can read dissertations of all faculties at 4F of Central Library. You can also search some of them on Tsukuba Repository of Electronic Resource List. 3◆Materials of Tsukuba Gakuin University and NTUT are directly accessible! You can access Tsukuba Gakuin University and NTUT (National University Corporation Tsukuba University of Technology) as well. 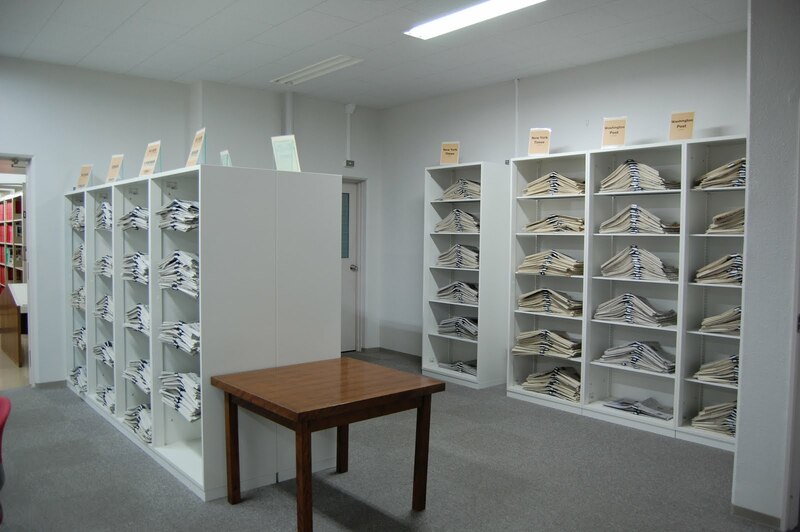 At Tsukuba Gakuin University, persons from outside the university can borrow its materials. If you want to get the materials which is not the holdings of UT soon, this is a recommended option! But to use its library, a routine procedure is needed, so check the below URL beforehand! As for NTUT, you cannot borrow its materials but you can enter the library without a letter of introduction. Do you know that the “MyLibrary” section of the library webpage can help you do various tasks without visiting the library? For example, you can confirm the status of your currently loaned or reserved materials and extend the loan period as well. To do this, you need to click on “MyLibrary” on the login section of the top page and enter your ID and password. Please be sure to try it. ＊Hints to save you as much as 2500 yen. Please use our book delivery services (AL). 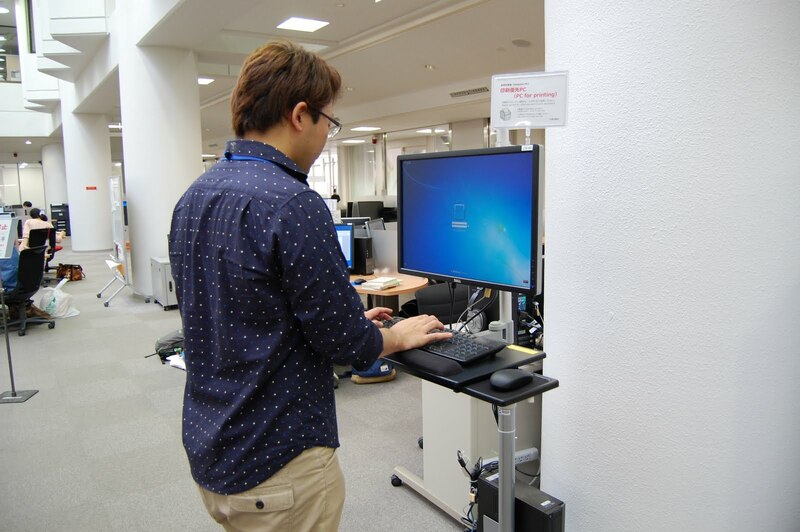 Even though some of the materials you need might be shelved in Otsuka campus library, you don’t need to worry about the transportation expenses of nearly 2500 yen to get there. You can borrow and collect them for free at any libraries in Tsukuba campus. Needless to say, you can use this service from Otsuka campus as well. ＊You can use Inter Library Loan (ILL)services (AL). 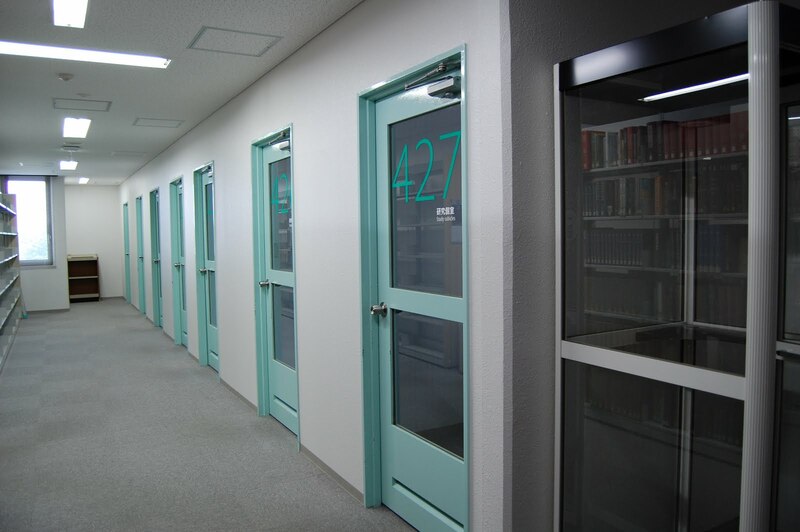 Do you know that you can also borrow books and articles which are not available at the University of Tsukuba Library from other universities? To use these services, you need to apply at the reference desk or on the library webpage. However, please note that you will need to do a few things beforehand, even if you wish to apply on the webpage. In this case, you will need to have registered for this service first via "Registration of Interlibrary loan online application (for private expense)" in the "MyLibrary" section. Then, you will need to submit the "application form" to the Reference Desk. Please make sure that you have the necessary money for the copy and postal fees which will be charged for using this service. If the materials you’ve obtained from other libraries are only for in-library use, you are not permitted to take them home. Please check this in advance. You may forget sometimes the due date for a book you have borrowed. In such a case, "Mail service"of the Library is a very convenient system to remind you of it. The system will inform you of the up-coming due date by e-mail. You may also receive information as soon as your reserved books are ready to use or other useful information from the Library. Please register your e-mail address from "My Library" of the Library top page. “Oh! Today is the due date! What shall I do…” That's no problem. You can extend the due date up to three times from "My Library" on the Library website. Incidentally, you cannot renew the due date if someone else has reserved the book in advance. Those students who have a purchase request for some books can apply for them online. Please fill in the designated form in the “Book purchase request for students” section on the upper right hand side. Detailed information is provided at the top of the form. Seminar Rooms provided for group use can be booked from "My Library" of the Library Top Page. The Seminar Room is appropriate for holding meetings like group studies, discussions and brainstorming in a limited time schedule. "We want to have a meeting but there’s no place to…" In such a case, you can use the Lounge and the Chat frame of the Library. On each floor (2F to 5F) of the Central Library, you will find these places where you can have a meeting, chat and relax. The whiteboard there is for your free use. Unlike Seminar Rooms, you need not apply for use in advance. "Refresh Zone" of the library is available for eating and drinking. You can drink or eat something in some spaces marked with the pictures below. Study Cubicles, independent exclusive space for study, are available for use by graduate school students and faculty members. Prior application from "My Library" of the Library top page is required. Reservation will be made on a first-come-first-served basis. After that you can occupy an individual space for your own. It provides you with an ideal space to concentrate on your studies. Many of you have already used campus-wide PCs and printers of the Central Library Main Building. In contrast, the Study Space of the 2F of the Annex is less crowded and quiet. Not a few quiet compartments are here. By bringing your own PCs, you can concentrate on your studies with higher efficiency. 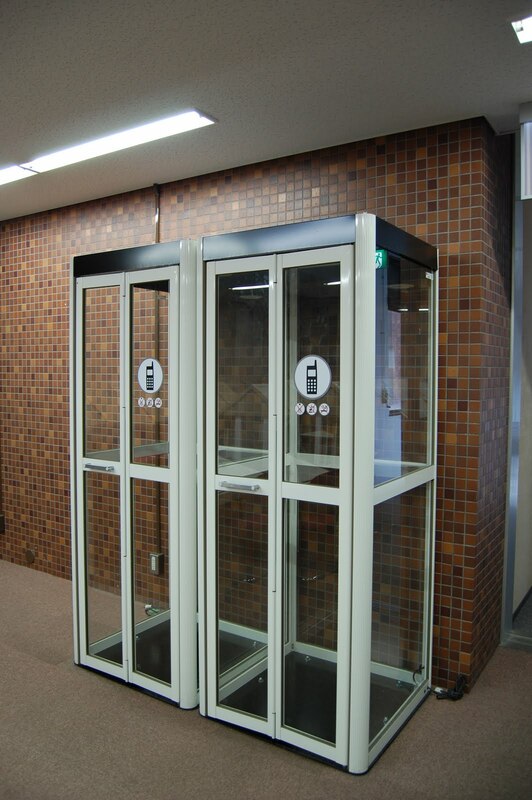 Near to the elevator of each floor, you’ll find Mobile Phone Booths, in which you are allowed to use your mobile phone. In lounges or Chat frmaes, as long as you do not bother other users, you can use your mobile phone. 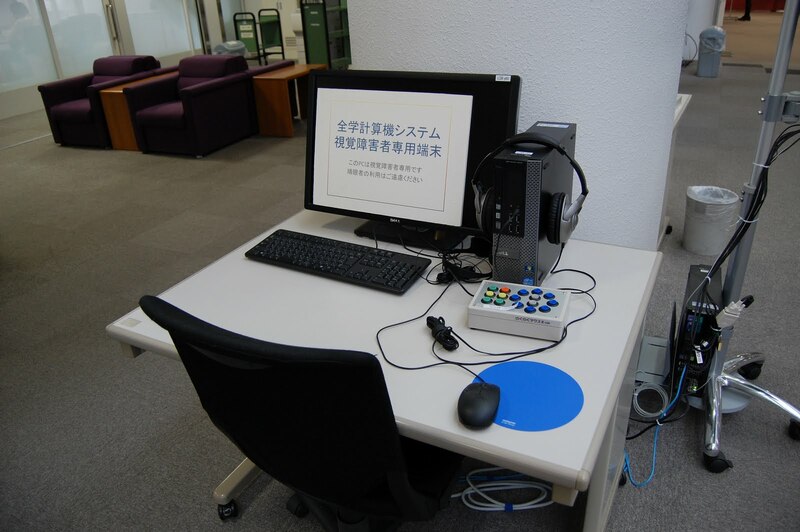 At the Learning Square on the 2F of the Central Library, there is a PC for visually-impaired persons. Button-type mouse is provided for the convenience of users, too. This PC is intended for the disabled, so non-disabled persons are requested to refrain from using. 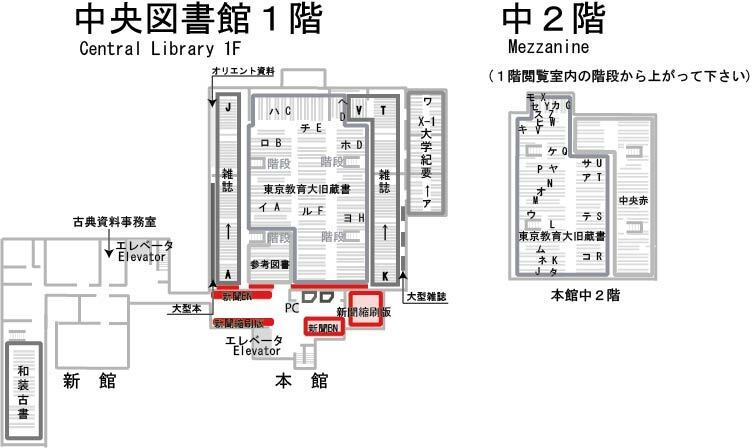 Reduced edition of some Japanese newspapers are in the 1F of Central Library. You can read digitalized back issues of newspapers at all branches. You can also access the article database of Nihon Keizai Shimbun and Asahi Shimbun from PC connected to university network. As for foreign papers, you can browse lots of titles using “ProQuest Central”. ★Some items can be used only in the library. You can access these items using a special PC near the Seminar Room C at the 2F of Central Library. Don't give up entering the Library when you notice that you've forgotten your student ID card. In that case, you can ask a library staff member at the main counter to open the gate. But you cannot utilize the services granted for your student card, such as borrowing books or printing by the campus-wide PC. Please don’t fail to carry your student card whenever you visit the Library. 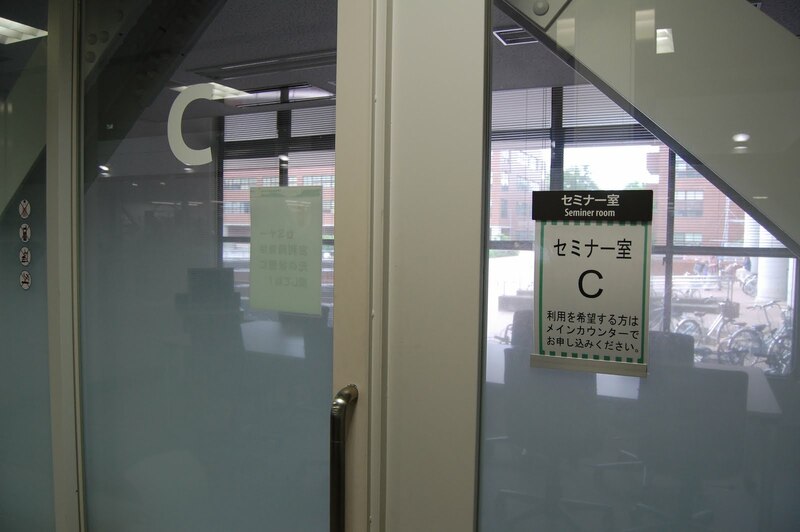 The University of Tsukuba Library welcomes visitors from outside.Visitors will receive a visitor's badge at the main counter. Why not recommend to your family and your friends from other universities to visit our Library. 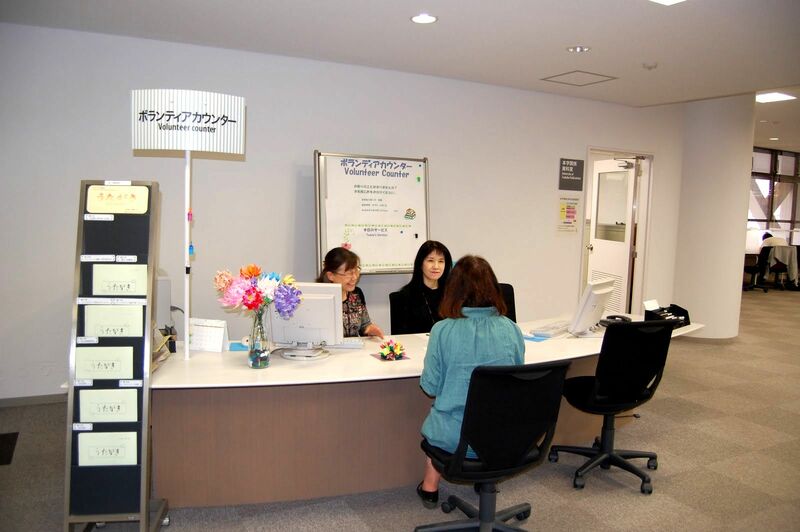 The book you borrowed from the library can be returned at every library in Tsukuba and Otsuka. Please return the books you read to the Library nearby as soon as possible. At the Learning Square on the 2F, you will find staplers for your free use. They are originally somebody's lost things and reused now for Library users. You may use them, but please refrain from taking them away with you. Graduate students, called Learning Advisers, will be available for consultation and support on your various kinds of learning activities at the Student Support Desk. They will help you in looking for references, checking the report you have written considering various factors from the student’s point of view based on encouraging your motivation, and trying to solve the problem together. They are awaiting your coming, from 14:00 to 19:00 on weekdays at the Student Support Desk on the 2F of Central Library. 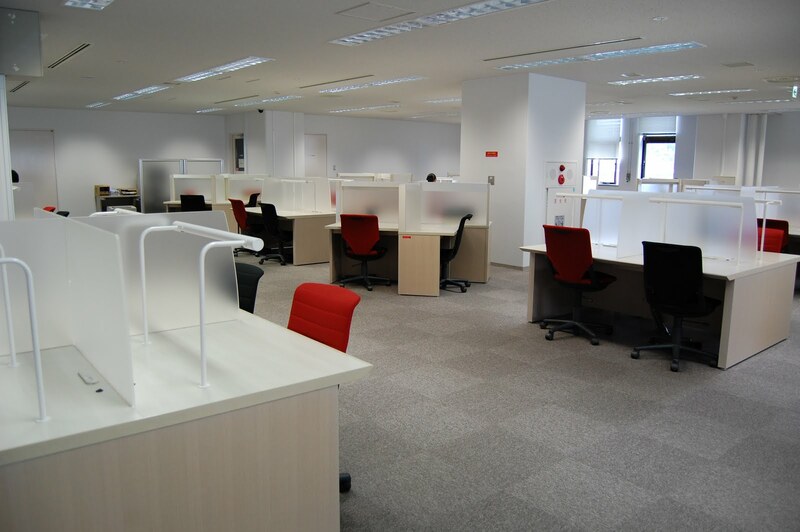 If you cannot find the materials you need on the shelves, for example, please contact the Volunteer Counter. English is acceptable, too. Actually, there are many services provided by volunteers, such as Library tours. “UTAGAKI”, a public relations magazine issued by them, will be of interest. Aren’t you under the impression that the Library is just a place to borrow books or do your works using computers? Actually the Library is providing various kinds of workshops (seminars, orientations) for its users from time to time. Library specialists give lectures on topics like how to search research papers, how to use databases, how to make effective use of the Library, etc. In addition, based on a request proposed by more than 2 persons, the Library will consider holding an “ order-made workshop” for you, if appropriate. Why not make the best use of the Library to upgrade yourself? 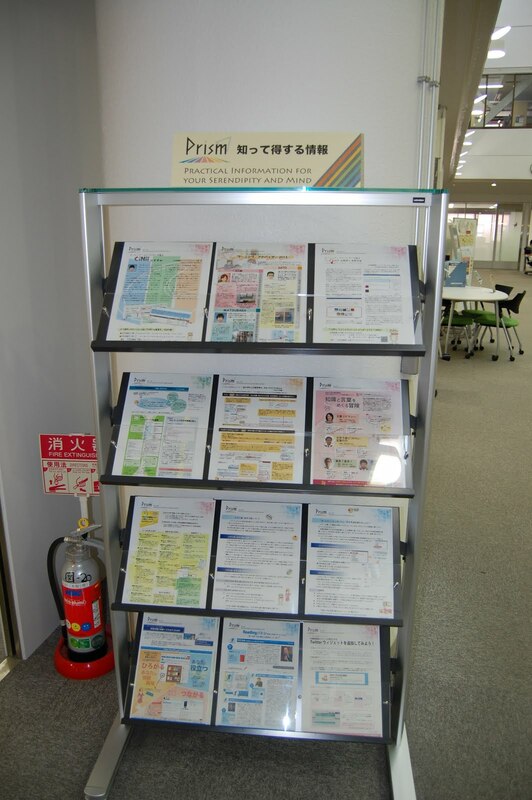 The Library leaflet “Prism” will provide you with valuable information to utilize the Library in more pleasant and effective ways. You will find there articles like, “How to search research papers”, “Seminars for academic writing,” etc. Please access to “Prism” from the Library top page. Also, printed copies are distributed to all 5 libraries.